(Nov. 15, 1945) – A new pipe organ will be dedicated on Sunday in honor of 53 members of the Silver Lake Baptist Church who are serving in the Armed Forces and in memory of Sgt. Edward DiCarlo who was killed in action in Guam. DiCarlo, who entered the service in 1942, saw action in the South Pacific and died June 26. His mother died in 1937. His father died this past January, when the Sergeant was home on emergency furlough. He is survived by his brothers Guy, Joseph and William. Sgt. 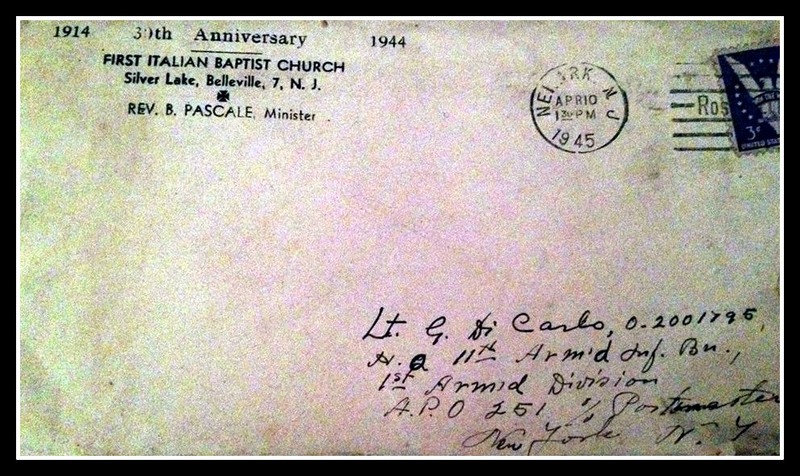 DiCarlo in a letter from Guam asked Rev. Benedetto Pascale about a stained glass in memory of his parents. The First Italian Baptist Church of Silver Lake was originally dedicated Nov. 21, 1914 with Rev. Pascale who was its pastor for 75 years. Thank you so much for the tributes you have provided for our veterans, Mr. Buccino. The item on Sgt. Edward DiCarlo is a most touching and powerful source of history for us, his family. He was the uncle we never knew. His brother, my father, Gaetano (Guy) DiCarlo, always spoke lovingly about his younger brother, Eddie, and would have been so touched to have read the newspaper article in 1945: he was still in Italy after the War, having been with the 11th ARMD INF BN and the 3195 SIG SVC CO. My father retired from the Army in 1965 as a Lt. Col. He passed away in 1991. I have only seen 2 photos of Edward DiCarlo – one from when they were children and one when he posed with my Dad, perhaps in the late 1930s. My Dad left New Jersey for college in Utah in the late ‘30s. What was left of the family after 1945 were the 3 brothers: Guy, Joe, and Bill – who was only 16 and for whom Eddie tried to arrange his care after their father’s death. I had searched through ‘Google’ looking at “DiCarlo” listings when I came upon your inclusion of ‘Edward DiCarlo’. Again, thank you for your efforts and for the enlightenment you have provided for us.